Based on Alexander Rose’s book Washington’s Spies, AMC’s TURN tells the untold story of America’s first spy ring. A historical thriller set during the Revolutionary War, TURN centers on Abe Woodhull (Jamie Bell), a farmer living in British-occupied Long Island who bands together with his childhood friends to form the Culper Ring — an unlikely team of secret agents who not only went on to help George Washington turn the tide of the war but also gave birth to modern spycraft. Quality dramas about the American Revolution are few and far between, on either the big or small screen, contributing to a sense of distance from this historical era. HBO’s excellent John Adams series, based on David McCullough’s biography, is about the best thing out there, but the overall offerings are thin. The Patriot, starring Mel Gibson, is an entertaining movie, but it’s not great history. So maybe TURN will breathe some needed dramatic life into this historical period. Nearly every day, I travel from my Boston neighborhood of Jamaica Plain to the downtown via the “T,” the local shorthand for the subway. During rush hours especially, the Downtown Crossing stop is crowded and loud, and all too often the human vibes throw off major amounts of impatience and stress. 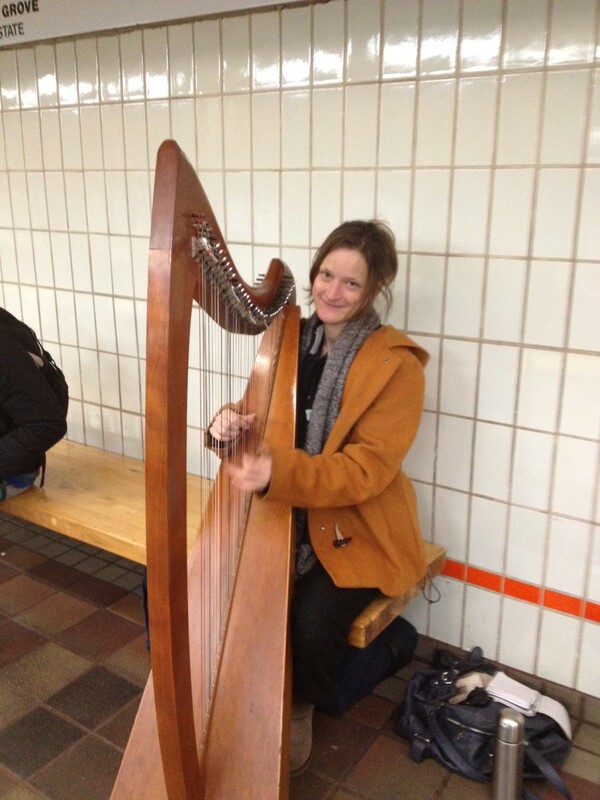 If I’m lucky, however, I’ll step off the train and hear the lovely sounds of classically trained harpist Alàis Lucette, who sometimes sets up there and helps to calm the nerves of frazzled subway travelers going to and fro. (You may listen to samples of her music and order her CD here.) There is something eminently civilizing about soothing music that cuts through the noise of mass transit. When I lived in New York City and made my daily subway commute from Brooklyn into Manhattan, on occasion there was a violinist who would make his way through the subway. While some interruptions in the subway can be irritating, this fellow was a welcomed distraction and instantly put me in a better mood for the morning. I’ve been living in cities all my adult life. I should be over the “novelty” of talented musicians playing in the streets and subways. But I can’t help it, it’s often still a treat to me, especially when the music takes me to a better place in my mind. In fact, I remember well the first time I heard and saw street musicians in full playing mode. After a collegiate semester abroad in England, I met up with some classmates in Paris, and we took the obligatory stroll through the Latin Quarter. It was filled with lively street music on a beautiful May evening. Perhaps this betrays how sheltered I had been in my NW Indiana upbringing, but I was absolutely taken by the idea that folks would just set up on the street and start playing! So here’s to those gifted makers of music who add joy and civility to metropolitan life. We city dwellers are indebted to them! Displayed above is a picture of a pizza place in some unspecified Italian setting. No, I didn’t buy it at a gallery or from a street artist. I cut it out of a pizza box top, from Il Panino Cafe & Grill in my Boston neighborhood of Jamaica Plain. It’s my favorite Italian/pizza delivery place. The food is a solid cut above the usual delivery fare, and the service is great. I’m a steady customer; in fact, I order from them often enough to know that the pizza box art, done by CM Design, isn’t even their normal box. I realize that I’ve just betrayed one of my culture blocks: I’m just not that big into art. In fact, my lowest grade in college by far was a D+ in . . . drumroll . . . Art Appreciation. And in my own perma-adolescent sort of way, I’m kinda proud of it. That said, I’ve taken steps to alleviate my block, including taking an art history course at a local adult education center, which I enjoyed. Anyway, having cut out the picture, I don’t know what I’m going to do with it. It’s not exactly suitable for framing — if you had it in front of you, you’d see a small grease stain. (It was a working pizza box, after all, not some stuffy show box.) But it captures for me the idea of good food in a relaxed, informal setting, with the water in the background — what I imagine a nice place in Italy would be like, which someday I hope to visit. And given how I’ve been feeling about work and my schedule lately, that makes for an appealing daydream. 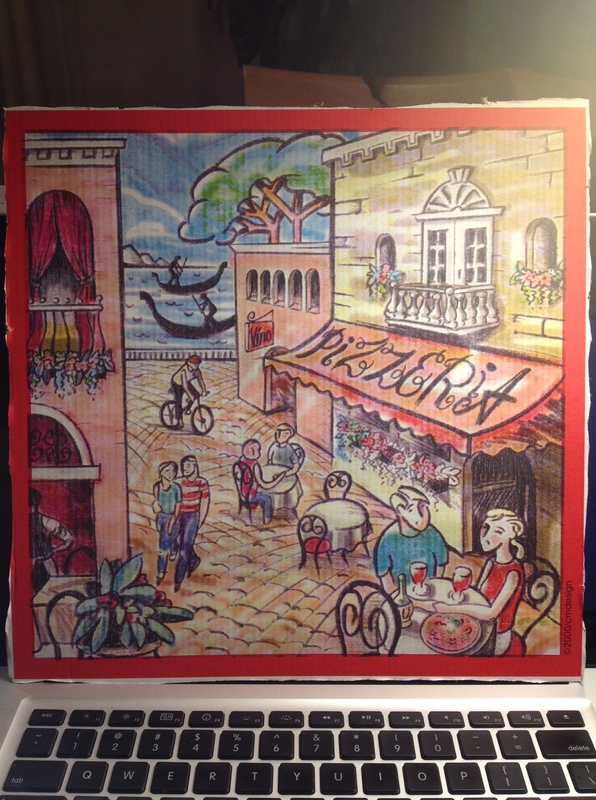 Well, I’ve just gone rhapsodic over a pizza box with some commercial art on it. I’ve taken up too much of your time already. But especially in the event I’ve inspired you to order a pizza, bon appétit. I happen to have some leftover slices in the fridge; I may have to heat them up now. My ongoing mind-over-matter battle with the winter elements has been buoyed by the annual arrival of Who’s Who in Baseball, a collection of lifetime records of active major league baseball players, at bookstores and magazine stands. The appearance of Who’s Who means that no matter how bad the winter has been, spring and baseball are not far away. In addition, Who’s Who has a much deeper meaning to guys (yes, mostly guys) who grew up following their favorite big league teams and players back in the day. As you can see from the cover of the current edition, Who’s Who has been around forever. 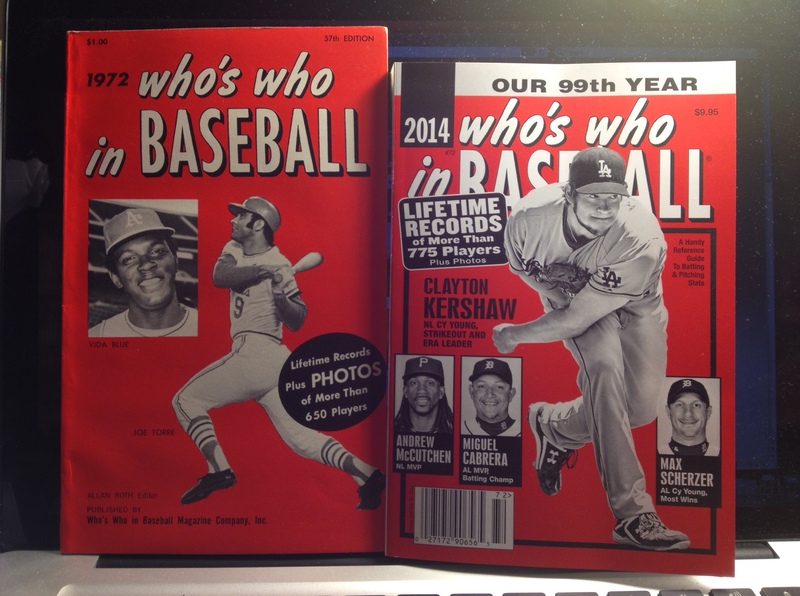 The 1972 edition pictured next to it goes back to my junior high days, when we followed baseball religiously. Although baseball statistics are now big business — practically everything about the game that can be measured with numbers appears in print or online somewhere these days — the basic format of Who’s Who hasn’t changed much over the decades. A devoted Who’s Who reader from the 1970s could look at the page below from the 2014 edition and instantly recognize where it came from. 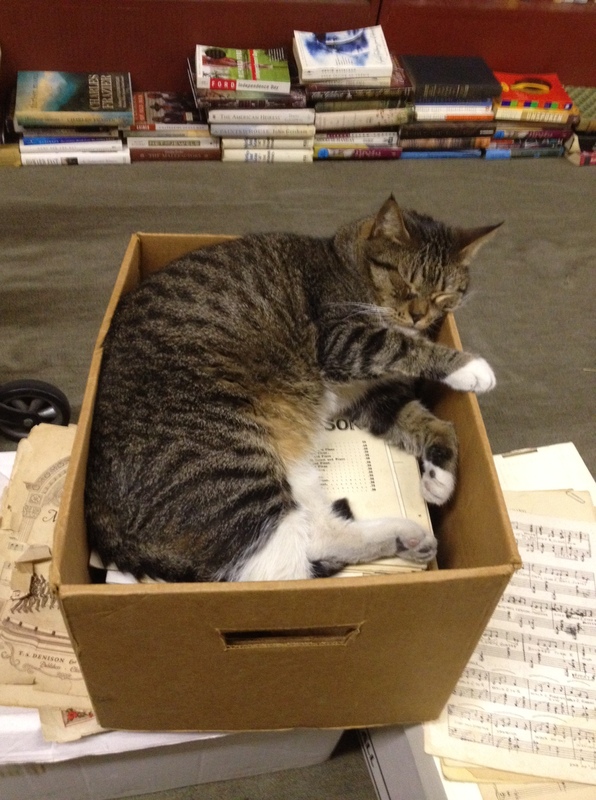 And oh, how we’d study those pages! I’m not alone in saying that even if I can’t remember what I had for lunch yesterday, I can still rattle off baseball stats from 40+ years ago. Who’s Who had a lot to do with that. Fantasy baseball wasn’t around back in those days. But some of us played dice-and-charts statistical board games like APBA, Strat-O-Matic, Statis-Pro, Extra Innings, and Gil Hodges Pennant Fever, which allowed us to recreate player performances on our tabletops. These games were the precursors to computer and video sports simulation games today, and Who’s Who in Baseball was a key source toward informing us which players to draft for our pre-digital fantasy baseball squads. The baseball stats explosion notwithstanding, I don’t need to know, say, how many times a guy grounded into a double play with two strikes on him. Hey, I’m a fan, not a big league manager. 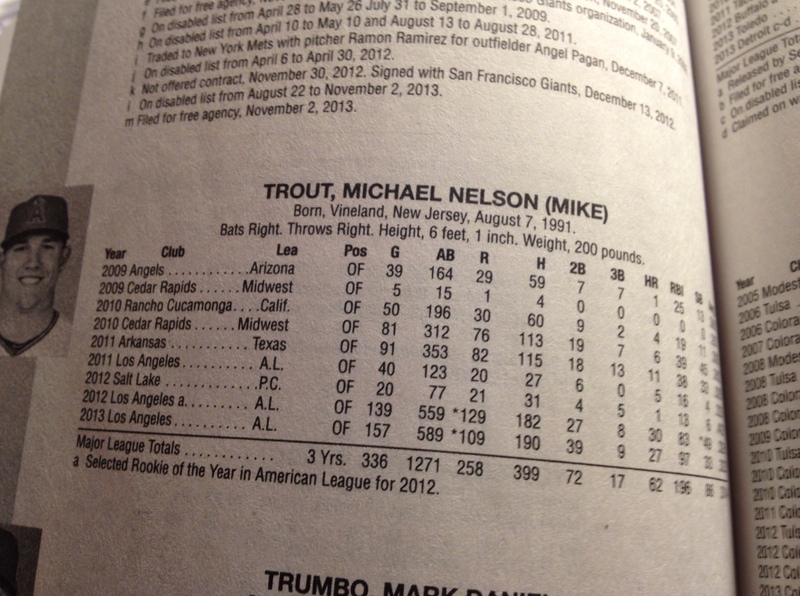 Instead, it’s more fun to flip through the pages of Who’s Who to trace players’ careers and to immerse myself in old-fashioned, plain vanilla stats like home runs, batting averages, wins, and ERA. APBA and Strat-O-Matic are still in business, offering both board and computer versions of their baseball games. Even in this digital era, sports board game devotees form a hardy bunch, featuring a lot of Generation Jones members! I’ll have more to say about that hobby in a future post. According to BuzzFeed.com, I should’ve lived during the French Revolution, I embody Dunkin’ Donuts, and I’m really either President Ulysses S. Grant or Downton Abbey character Bates. And if MentalAge.com is correct, I’ve done all this before hitting 30! It says my mental age is 28. Not so sure about this one! There’s a time, not too long ago, when I would’ve been ecstatic at anything, however frivolous, that rated my age at 28. But to be honest, I wouldn’t want to climb back into that young man’s head. No how, no way. 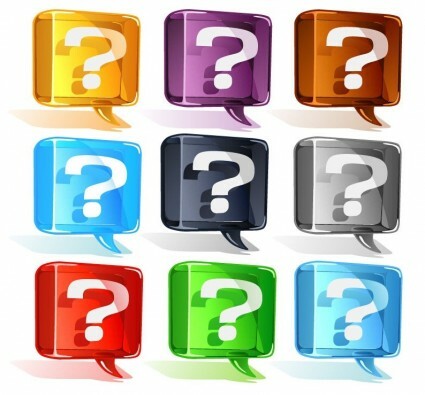 So maybe all of these answers are being fed into some huge marketing database. If so, whatever. But if I do wake up to find myself facing a French guillotine, I hope they’ll give me a DD dark roast and French cruller before I go. 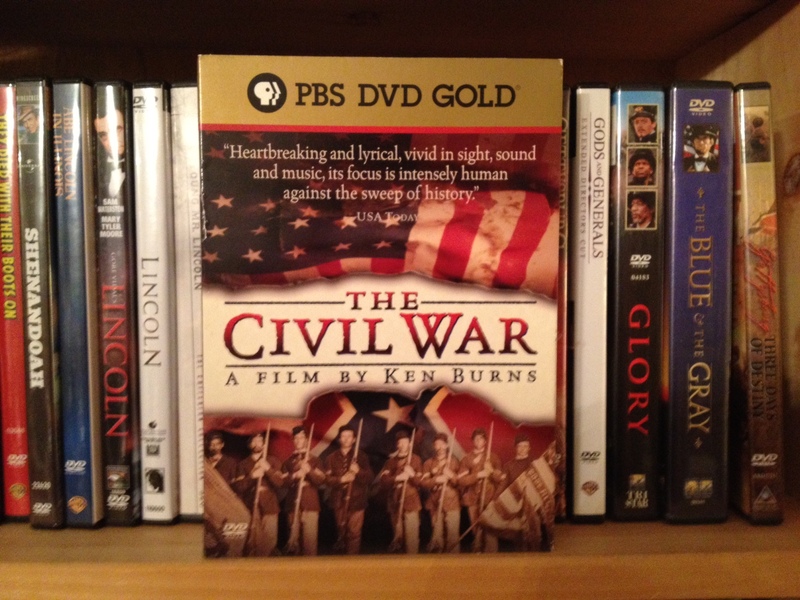 Some 24 years have passed since the premiere of the groundbreaking PBS documentary series, “The Civil War,” by Ken Burns. It stands as probably the best historical documentary series ever made. Burns mixed photos, graphics, interviews, readings, music, and pitch-perfect narration by historian David McCullough to create an evocative and gripping story of America’s Civil War, fought from 1861 to 1865. 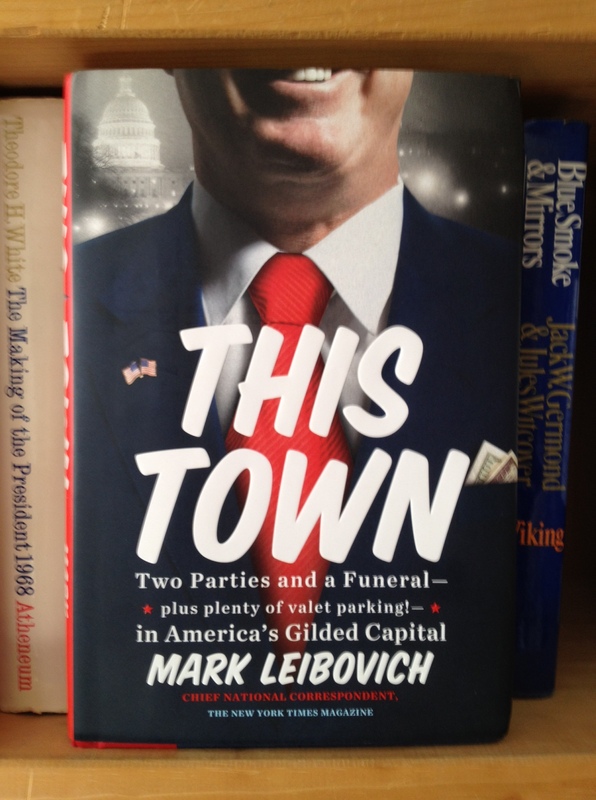 At the time it aired, I was a broke-as-hell public interest lawyer in New York, with no cable and a rabbit-eared black & white television set given to me by friends. The lack of decent TV reception made no difference; I knew I was watching an instant classic. Burns and his team pulled off the seemingly impossible. In nine episodes totaling roughly eleven hours, they made an era come alive in documentary form. No CGI. No Civil War re-enactors. Just brilliant content. Of course, the series was criticized by some partisans for North and South alike for what it did or didn’t do, but the overall response to “The Civil War” was abundant, enthusiastic praise. It helped to rekindle a national interest in Civil War history that endures to this day. It certainly had that effect on me. Even better, rent or pick up the series and watch it. You’ll get the whole deal, a documentary that breathes heart and soul into a story of one of the signature events in American history. And you’ll never tire of hearing “The Ashokan Farewell” over and again. I have to toss in a side note about series narrator David McCullough, one of America’s leading popular historians. Several years ago, McCullough spoke at Boston’s Old South Meeting House — a key stop on the city’s “Freedom Trail” of historic Revolutionary-era sites — to preview one of his upcoming books. He started his talk by looking up at the packed house, opening up his arms wide, and warmly proclaiming “Aren’t we lucky to be here! ?” It was his own way of celebrating how we all could share our love of history in this significant building. For a history buff like me, it was such a great, fun moment. 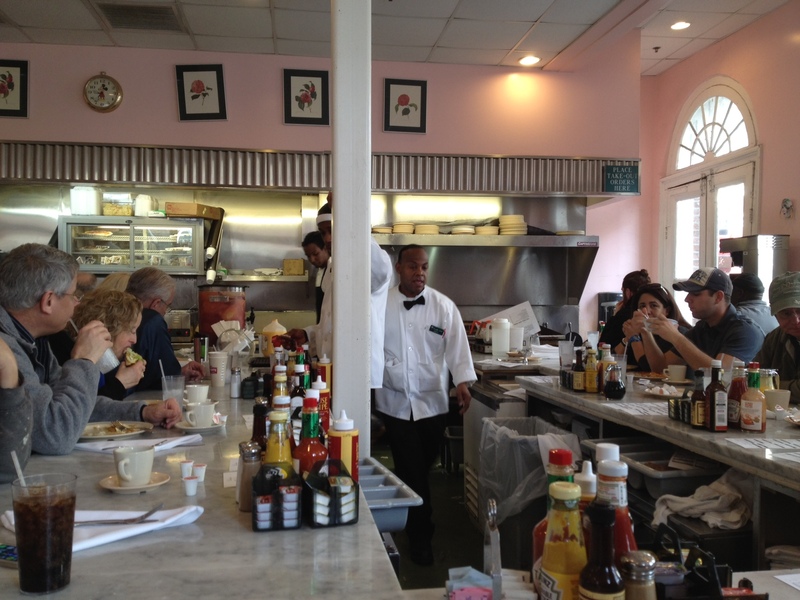 New Orleans has a mythology, a personality, a soul, that is large, that has touched people around the world. It has its own music (many of its own musics), its own cuisine, its own way of talking, its own architecture, its own smell, its own look and feel. At least during those five months of the year when it isn’t unbearably hot and humid, I can’t think of a more fascinating American city to visit than New Orleans. I’ve been in New Orleans for a conference, and it’s my first trip to the city in 15 years. 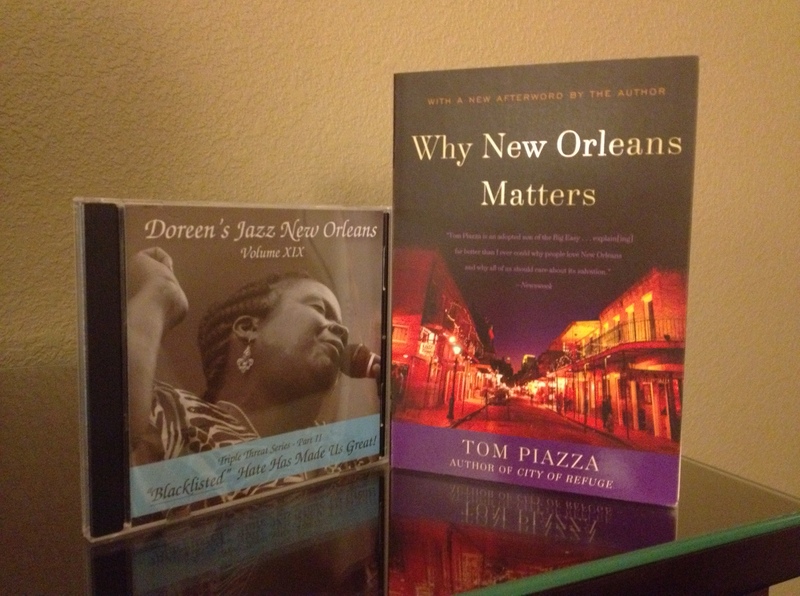 Obviously NOLA (as they call it) has been through a lot in the post-Katrina years, but it retains the unique look and feel that Tom Piazza wrote about in his eloquent tribute to the city as it struggled to recover from the storm and flooding. Some of my college pals who read this blog know all-too-well how much our semester abroad in England and accompanying post-semester sojourns imprinted themselves on me. 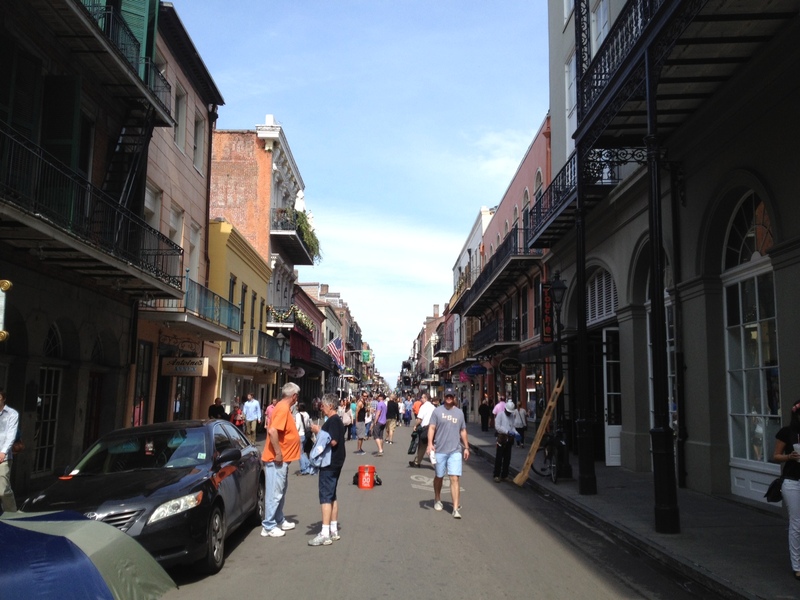 Ever since, I’ve welcomed opportunities to re-experience the adventure of youthful European travel, however briefly, and New Orleans allows me to do just that without need of a passport! Seeing artists displaying their work in Jackson Square reminded me of my first visit to Paris over 30 years ago. 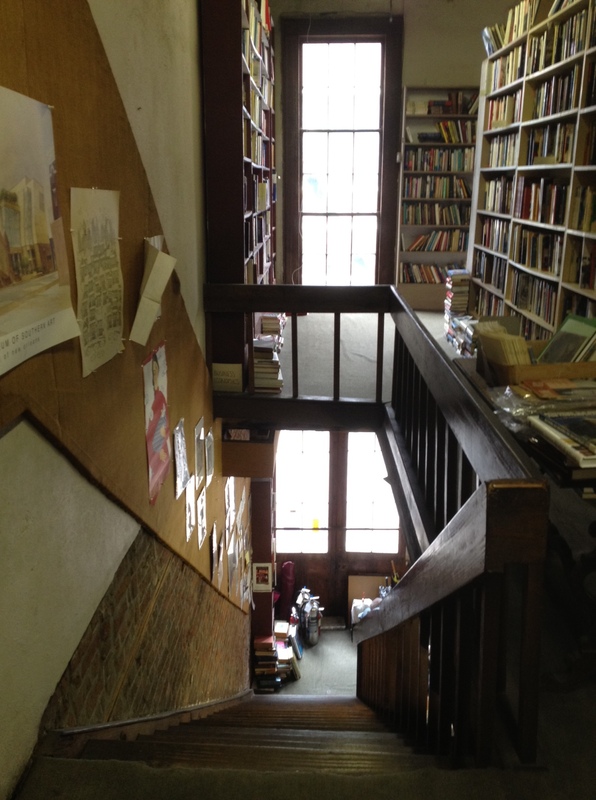 Being the bookstore hound that I am, I had to seek out a few of the city’s bookstores. Here’s Beckham’s Bookstore on Decatur Street, a great used bookstore with piles of books next to filled-up shelves that, well, sorta reminded me of my condo! Beckham’s comes replete with its own resident cat, who apparently commandeers whatever space is convenient in order to get in a well-earned nap. NOLA is home to some incredibly talented musicians. 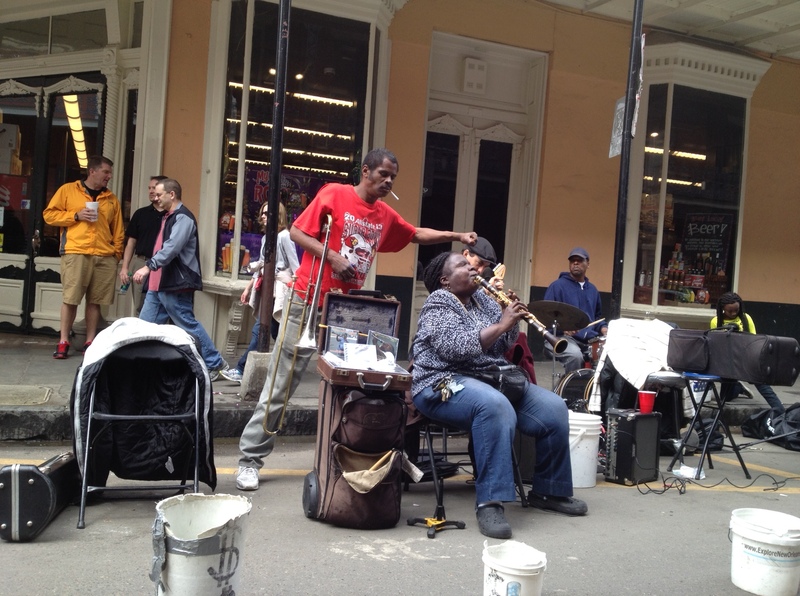 Here’s a great jazz band playing on Royal Street. 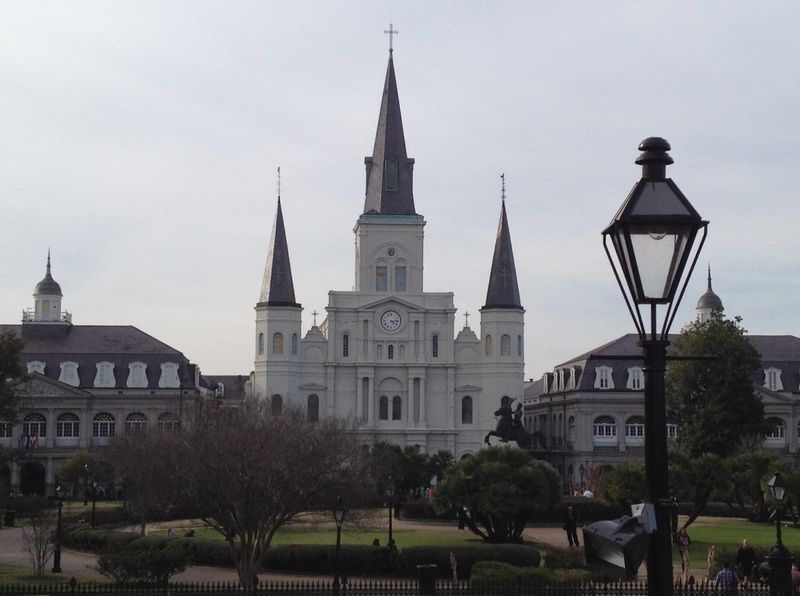 NOLA’s history has its ghastly side that, not surprisingly, sometimes turns ghostly. 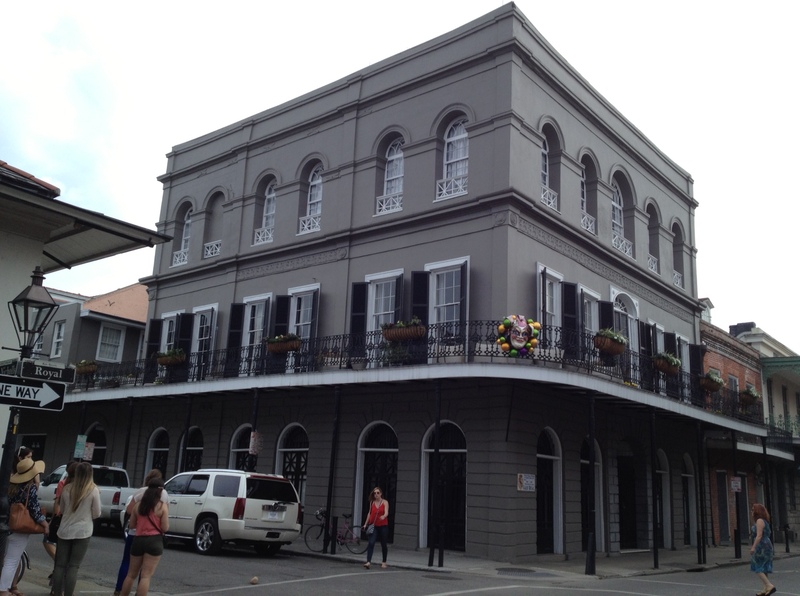 For example, pictured here is the house of Madame Delphine Lalaurie, who is said to have committed horrific acts of torture on her slaves during the 1830s. Though some claim that she has been unfairly indicted in the court of history, the most authoritative book that I’ve encountered on the topic, Carolyn Morrow Long’s Madame Lalaurie, Mistress of the Haunted House (2012), sides with the accusers. Naturally, the house is a favorite stop on the countless French Quarter ghost tours, and though I didn’t encounter anything supernatural when I was clicking away with my camera, I wouldn’t be eager to spend a night there. Not all of the historical offerings are uniquely local. New Orleans also is home to the impressive National World War II Museum, co-founded by noted historian Stephen Ambrose, who taught at the University of New Orleans and whose books about D-Day and the European Theatre inspired the HBO series “Band of Brothers.” The museum, which continues to expand, includes a large hall containing vintage aircraft. 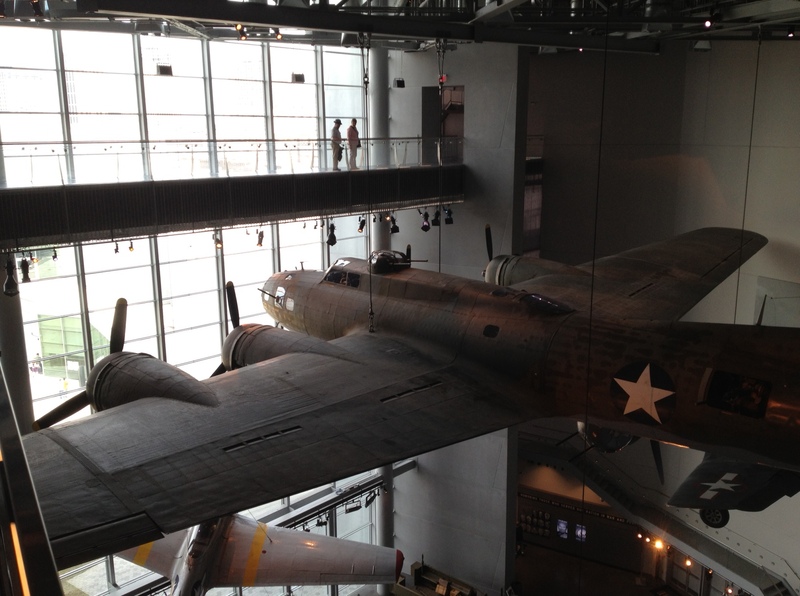 Here is a B-17 “Flying Fortress,” an iconic U.S. bomber plane of the era. 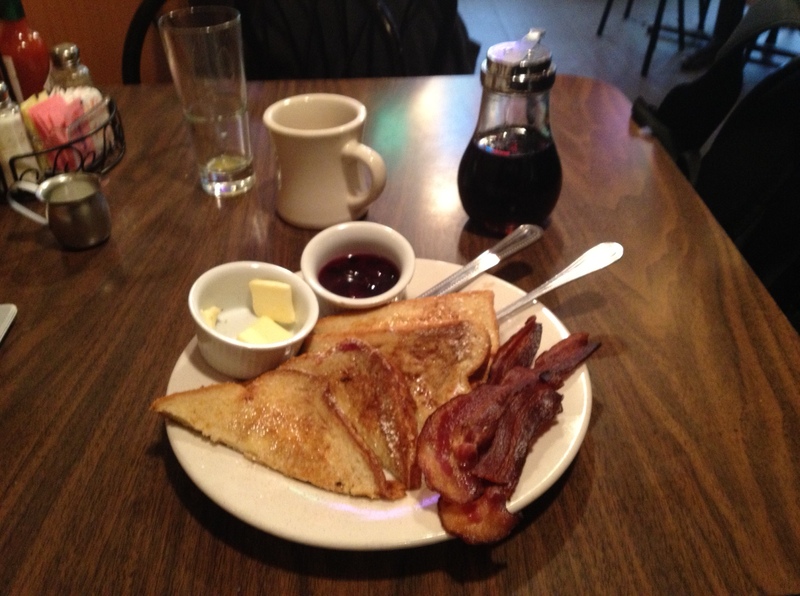 …and Jimmy J’s Cafe, whose wonderful cinnamon French toast is pictured here. I think an order of French toast is a good way to conclude this blog post. Enjoy! 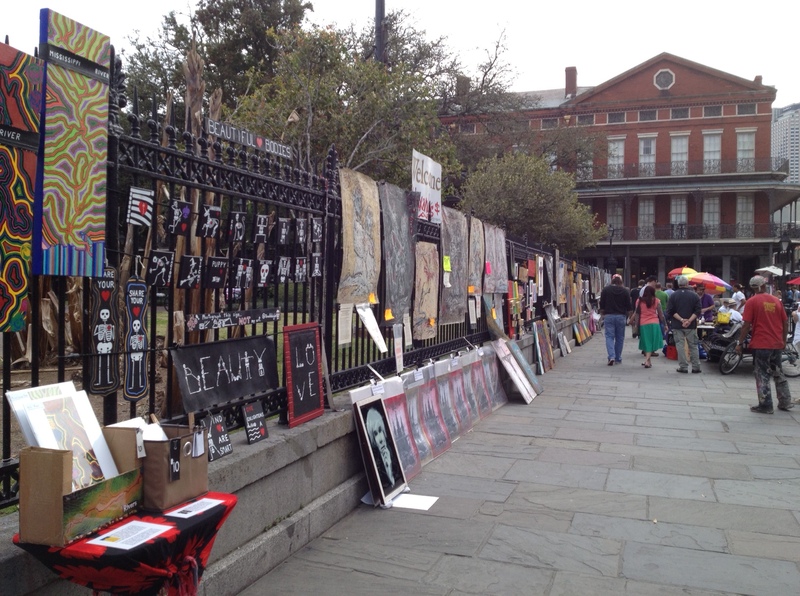 For a short piece on the psychology & law conference that brought me to New Orleans, go here. 6:30 — “Adam-12” — A cop show, co-produced by Jack Webb, featuring patrol officers Reed and Malloy on the streets of pre-Rodney King Los Angeles. 7:00 — “Get Smart!” — I didn’t appreciate the brilliant humor until I was older, but this spy vs. spy sitcom featuring Don Adams as dimwitted Agent 86, Maxwell Smart, and Barbara Feldon as his brainy, beautiful partner, Agent 99, made for excellent comedy! 7:30 — “My Three Sons” — Featuring Fred MacMurray as a widower raising his three sons. A sentimental, feel-good family sitcom. Extra points for those who can hum the all instrumental theme song. 8:30 — “Petticoat Junction” — A light sitcom set at the Shady Rest Hotel in the rural town of Hooterville, featuring a neat old steam train and three comely lasses, Billie Jo, Bobbie Jo, and Betty Jo. Those who tired of the Ginger vs. Mary Ann debate could refocus their attentions here. 9:00 — “Mannix” — The only one-hour show on the list. A private detective series featuring Mike Connors as tough guy Joe Mannix. He was sort of the clean-up hitter of the Saturday night lineup. Of these programs, only “Get Smart” and, yup, “Hogan’s Heroes” manage to hold up over time, due to some hilarious characters and clever dialogue. But back then, Saturday night TV meant an uninterrupted run of fun shows and after-dinner goodies, staying up late with no school the next day — a more innocent time of life, before the tumult of adolescence, and with little more to worry about than whether Mannix would catch the bad guy. You can check out the full 1968-69 television lineup here on Wikipedia.